OK, so I had a bit of writer’s block this week and my on-line teaching kept me busier than normal, so I didn’t make this week’s post on time. I’m on a variety of lists and sometimes I reflect on their relationship to PSYOP. Of course, I’m one of those heretics that believes PSYOP is a form of marketing and sales – not the same as selling toothpaste and iPads, but related nevertheless. 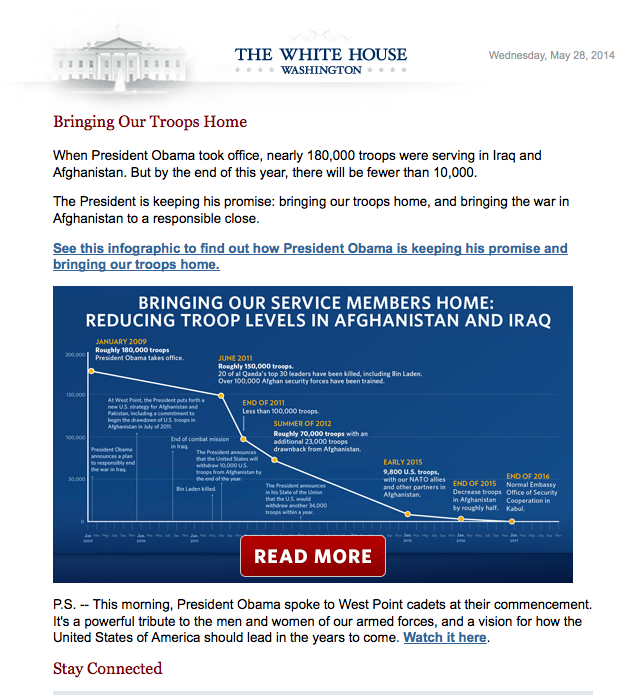 The page at the right is from www.whitehouse.gov. I recognize that Tuesday’s (3 June 14) elections are pretty much small potatoes and the Secretary Clinton is about to embark on a book tour which many regard as ‘coming attractions’ to her likely presidential campaign. I’m also aware the President Obama is in the last laps of his presidency and his thoughts are likely turning to life after the White House. Nevertheless the graphic is worth a closer look for its influence value, not necessarily its content. From an influence perspective – simple easy to read graphics are good tools. By carefully designing the graphic and the scale you can pretty much get the graph to say virtually anything you would like the reader to infer. This one is a particularly good example of that technique. All of us in the Community know there is more to the ‘war’ in Afghanistan that the number of boots on the ground. Even if the numbers are accurate, there is certainly more to the story and to interpreting whether or not this particular ‘promise’ has been kept. Iraq - Deja Doo Doo!